In early 1895, young Harry and Bess Houdini got what they believed was their big break; a week's engagement at Tony Pastor's prestigious 14th Street theater in New York. It was their first shot at "the big time." Tony Pastor's was the pre-eminent theater for variety entertainment, or what Pastor coined as "Vaudeville", in all of New York City. Opened in 1881, Pastor's offered a wide selection of acts that guaranteed "refined" wholesome entertainment that could be enjoyed by women and families. It was a winning formula and Tony Pastor's 14th Street Theatre was enormously popular. However, by 1895, Pastor was facing serious competition. 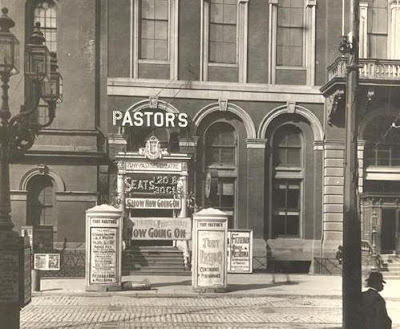 Newcomers B.F. Keith and Edward Albee had opened the Union Street Theater that directly challenged Pastor with their own "refined" vaudeville. Looking for an advantage, the Union offered lower ticket prices and what it branded as "continuous vaudeville", shows that ran non-stop from 12:30 PM to 10:30 PM, divided into matinee, supper, and evening shows. Pastor resisted the idea of continuous vaudeville which he called "Ferris Wheel Shows." His 14th Street theater offered matinee and evening shows only. But the Union began to drain not only customers away from Pastor's, but also talent. This meant Pastor had to broaden his search for new acts, and one of those acts where The Houdinis. Tony Pastor's! Houdini could hardly believe it. That famous hall was still in its glory in the nineties, a national institution, as well known in its way as its immediate neighbor, Tammany Hall. Houdini was so excited by the prospect that he spent all his money advertising in the theatrical papers: "Next week at Tony Pastor's—The Great Houdinis, Harry and Bessie." How thrilled they were when they walked out on the stage for their first show! The cleaning-women had hardly finished, and were still in evidence with their pails and mops. Instead of an orchestra there was only a lone pianist. Barely twenty-five persons were in the house. But Houdini, his head in the air, spoke to them as he did later to thousands. He had no doubt that such a stage was his proper place. "My God, child!" she exclaimed. "Who made you up?" "I did it myself," stammered Bess. The older woman smiled. "Come in here, kid," she said. "Let me fix you." As the story continues, Houdini barely recognized Bess when she re-joined him in the wings. Maggie Cline watched their act and later recommended that Pastor move them to a better position on the bill, which he apparently did. No more performing for the cleaning crew. Years later, when Houdini was headlining at Keith's in Boston, he again shared the bill with Maggie Cline who was then performing her farewell season. Bessie reminded her of her kindness. But try as she might, Maggie could not remember meeting the young Houdinis. The Houdinis finished out their week and received a terse letter of endorsement from Pastor (below). Unfortunately, their week playing the big time did not lead to bigger things, and The Houdinis went back to playing dime museums and beer halls. "The Houdinis act as performed here I found satisfactory and interesting." Now, every available Houdini biography leaves the story there -- that Harry and Bess played this one week at Tony Pastor's and then went back to the small time. But the truth is they played Pastor's at least one more time the following year (and it wouldn't surprise me to learn they played Pastor's several times). Evidence of this return engagement has been hiding in plain sight. On page 35 of James Randi's Houdini His Life and Art there is a photo of a Pastor's program dated Monday, October 12 with The Houdinis at the bottom of the bill. The book captions it as: "First appearance at Tony Pastor's in New York." 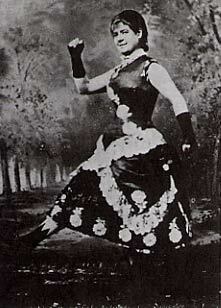 However, Maggie Cline is not on the bill, and October 12 fell on a Monday in 1896. 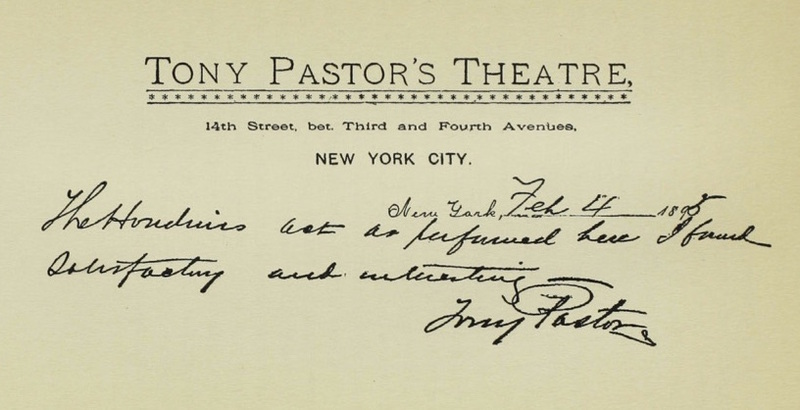 As Pastor's telegram establishes February 1895 as their first appearance, this can only be a return engagement. By this time, Tony Pastor had given in and was now offering continuous vaudeville. No doubt in an effort to fill the bill, the Houdinis were "satisfactory and interesting" enough to book again. The program also shows Pastor's was now offering movies -- The Kineoptikon. But even this second engagement did not lead to bigger and better things. In his scrapbook, which Houdini used to solicit bookings, he carefully altered the program, making it appear as if they had occupied a better position on the bill. Keith-Albee, along with their west coast partner Martin Beck of the Orpheum circuit, would come to dominate and monopolize vaudeville in the new century. 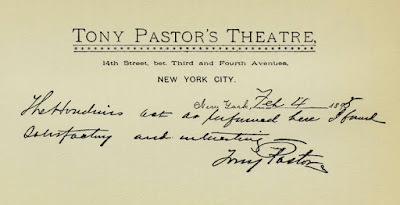 Unable to compete, Pastor closed his 14th Street theater on June 6, 1906. Houdini would go on to become a star on the circuit that has been Pastor's undoing. Tony Pastor died in 1908. The building that housed his theater (and Tammany Hall) was demolished in 1927. But Tony Pastor's rose again in the 1953 biopic Houdini with Tony Curtis and Janet Leigh. It's at Pastor's -- here portrayed as more of a dinner theater -- that Harry plays an old man in a "Fountain of Youth" act and steals Bess away from her date. It's a fitting nod to a theater that must have held nostalgic memories for The Houdinis. The information on Pastor's and the Union Street Theater comes from the book Vaudeville Wars: How the Keith-Albee and Orpheum Circuits Controlled the Big-Time and Its Performers by Arthur Frank Wertheim, which I highly recommend. UPDATE: The great Fred Pitella sends over this image of the original newspaper playbill for The Houdinis first engagement at Tony Pastor's, which we see commenced Monday, January 7, 1895. Thank you Fred! Wow very cool discovery John! I hate to say it, but I've found all Houdini bios (except Silverman) pretty much just lift all the early career info right from Kellock. It's shocking how similar the chapters are. Wish I could look through that first Houdini scrapbook. What other assumptions might we be able to challenge? Well, if that playbill is an indication of the running order, putting the Houdinis in the closing spot - i.e., the one that was intended to clear the house for the next show - was little better than performing for the cleaning women. I remember seeing the evidence that the Houdinis played Tony Pastor's at least twice when I first read it, but, I am sure I saw the evidence somewhere else. I think it may have been in the early scrapbook that Sid Radner donated to Appleton. Indeed, I think playbills from both engagements (maybe more?) are in that first scrapbook that Sid owned. I'm assuming that's now in DCs collection? Really interesting stuff. It still amazes me that Bess and Harry didn't get better recognition during both engagements. Their act seemed like it would have appealed to the more genteel crowd at Tony Pastor's better than most. Really hard to know what audiences of that time responded to and why. But the fact that Pastor brought them back shows the act did work at the theater. There's a case to be made that Houdini's delayed fame was because the world wasn't yet ready for him. Houdini really clicked into the new world of big time vaudeville circuits and mass media. Those were still formulating in 1895. Good point. I can only imagine the mega marketing campaigns he would have done in an era with television and the internet as well! I always thought that HH's delayed fame was the result of not setting himself apart from his competitors. Martin Beck saw HH's potential with the challenge handcuff act and straightened things out. Just to let you in on something Tony Pastor was one of the charter members and founders of the Benevolent Protective Order of Elks in NYC. Being that of New York Lodge #1!